Tens of thousands of Shia Muslims have marched against coalition proposals for a transfer of power, just hours before the US sought UN backing for the plan. US administrator Paul Bremer is having talks with UN chief Kofi Annan to try to elicit his support for its plan for an interim selected authority. He was also seeking the return of UN staff to Iraq, after their withdrawal following bomb attacks last year. Iraq's Shias majority want direct elections to a transitional government. The rally in Baghdad came four days after a peaceful protest in Basra demanding direct elections. 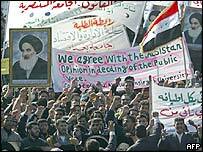 Any sustained opposition by Iraq's Shias would cause serious problems for the US, correspondents say. Monday's protest saw thousands upon thousands of Iraqis marching through the capital, many clasping each other's hands above their heads. The BBC's Caroline Hawley in Baghdad says the Shias - who were repressed for decades by Saddam Hussein - fear they will be marginalised again under the US plan, which allows regional bodies created by the Americans to select a transitional parliament. "Yes, yes to elections; no, no to selection," was one of the main rallying cries. The protests add strength to the opposition voiced by Iraq's top Shia cleric, Ayatollah Ali al-Sistani, whose support is seen as key to legitimising an Iraqi-led administration. One of his representatives, Hashem al-Awad, addressed the Baghdad rally with a warning to coalition authorities. "The sons of the Iraqi people demand a political system based on direct elections and a constitution that realises justice and equality for everyone," he said, quoted by the Associated Press news agency. "Anything other than that will prompt people to have their own say." Our correspondent says this is a difficult demand for the Americans to ignore, as they have promised to introduce a democracy. 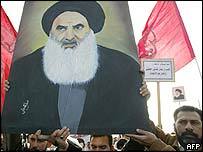 The Shia rallies put added pressure on Monday afternoon's meetings between Mr Bremer, members of the Iraqi Governing Council and UN Secretary General Kofi Annan. Diplomats say Mr Bremer wants Mr Annan to tell Shias that elections are simply not possible before a 1 July deadline for a handover of power to Iraqis. The BBC's Susannah Price at the United Nations says the US hopes that a UN stamp of approval would halt criticism from the Shia community. But the outcome of the meeting is far from certain. Mr Annan has said the UN would be willing to return to Iraq, but only if it has a role commensurate with the risks faced by its staff. He withdrew all UN workers after a massive bomb attack on the organisation's offices in Baghdad last August which killed 23 people, including special envoy Sergio Vieira de Mello. Opponents are continuing to launch deadly attacks on targets of the US-led coalition forces running Iraq. A total of 24 people were killed and more than 100 injured on Sunday when a suicide car-bomber attacked a crowd outside the coalition headquarters in Baghdad. Most of those killed were Iraqis. "Today, the UN's headquarters still deserted after last summer's bombing"